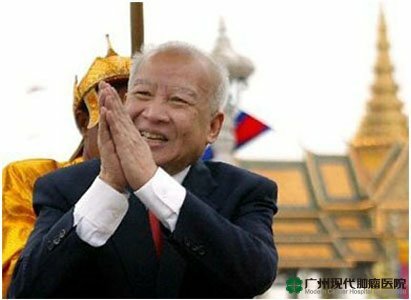 On October, 15, 2012, Cambodian retired King Norodom Sihanouk passed away at the age of 90 in China's capital city of Beijing. He is the foreign leader that has paid the most visits to Tian An Men, one of the most famous ancient architecture of the capital of China. Chairman of China, Hu Jintao said in the telegram of condolences to King Norodom Sihanouk’s death: “King Norodom Sihanouk is a great friend of Chinese people. He has committed himself to China-Cambodia friendship and established profound friendship with generations of China’s leaders. On October 17, Tian An Men square and Xinhua Men of Beijing flied at half-mast to show condolences to King Norodom Sihanouk. This is the highest courteous reception having been showed to a foreign leader in China. Besides his excellent political skills, the most adorable thing of this “father of independence”, which is titled by Cambodian people, is his constantly fighting against cancers during his last 20 years starting from 1993, when he was 71 years old. Just like his glorious and rocky life, his three experiences of cancer treatments in China, with a record of no recurrence for 11 years after the first treatment, has become a legend story. In 1993, King Norodom Sihanouk was detected with B-cell lymphoma in a routine health examination in Beijing Hospital and diagnosed with prostate cancer. Unlike other common people, King Norodom Sihanouk was very calm when hearing this unacceptable news. His spirit of actively fighting against cancer gained him very good improvement after about one-year treatment. Medical science tells us that anxiety and fear can bring down patient’s immunity or even destroy his entire immune system. Therefore, many patients die of anxiety and fear, rather than cancers. However, King Norodom Sihanouk’s love to life and confidence helped him drive off cancer and keep recurrence away for 11years. When asked about the treatment performed to King Norodom Sihanouk, Zhang Jiuhuan, department chief of Chinese Foreign Ministry Asian Affairs, told reporters that it was combination of Chinese medicine and Western medicine that had once controlled his condition. Since he drove off cancer in 1994, there was 11 years where no recurrence occurring to him. Until one day of 2005, he was found with metastasis to the stomach from the cured prostate cancer 11 years ago. At that time, he was 83 years old already. Considering about his health, he decided to retire and go to China for long-term treatment of combination of Chinese medicine and Western medicine. The success of his first treatment gave him firm belief that combination of Chinese medicine and Western medicine is the best treatment for cancer. Since January, 2005, he had been admitted in a hospital in Beijing, China. He said the doctors took the sample from his bone marrow to determine his condition and make relevant chemotherapy treatment plan and that he believed the operation would prolong his life. Indeed, after treatment, his condition was again under control. King Norodom Sihanouk’s experience tells us cancer is not horrible if we maintain positive attitude and actively cooperate with treatment and that combination of Chinese medicine and Western medicine is a miracle in medical science. It can prolong totally 20 years the life of an aged man, who had cancers and meanwhile many other diseases like diabetes.